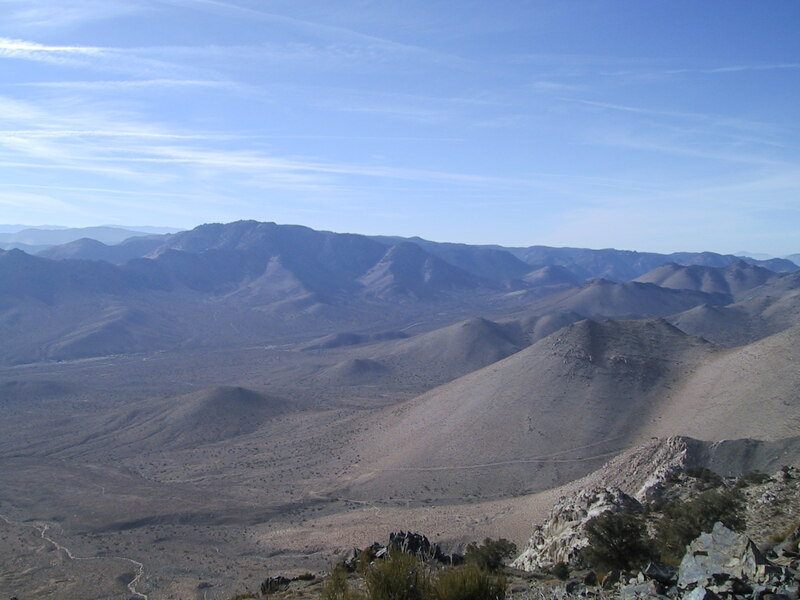 Scodie Mountain is located in Kern County, about 15 miles east of the town of Weldon, 150 miles from Los Angeles. It is in Sequoia National Forest and Kiavah Wilderness. Scodie Mountain was added to the HPS Peak List in 1970. See the Summit Signature for more history and some background about the name of the peak. HPS has three documented routes to the peak. Route 1 is 7 miles round trip with a total of 2300' of gain, almost entirely cross country, after a brief stint on the Pacific Crest Trail. Route 2 is 3.6 miles round trip, 2200' total gain, almost entirely cross-country. Unlike the other routes, this one requires extensive dirt road driving. Route 3 is 9 miles round trip, 2800' gain, with a few miles of hiking on a dirt road, the rest cross-country. Older Peak Guides (routes may no longer be legal or safe, use caution! ): 1993, and Microsoft Word version from 2001. Area was closed on July 12, 2014 due to the Nicolls Fire, but reopened on July 22. Gate status: Routes 1 and 3 are easily accessed from State Route 178 (see below). Route 3 involves much dirt road driving on BLM roads. If in doubt, check with the BLM Ridgecrest Field Office, 760-384-5400. Deer hunting season - "The season in Zone D-9 shall open on the fourth Saturday in September and extend for 30 consecutive days." For more information, visit the California Fish and Game Commission. Adventure Passes are not currently (2011) required by Sequoia National Forest.